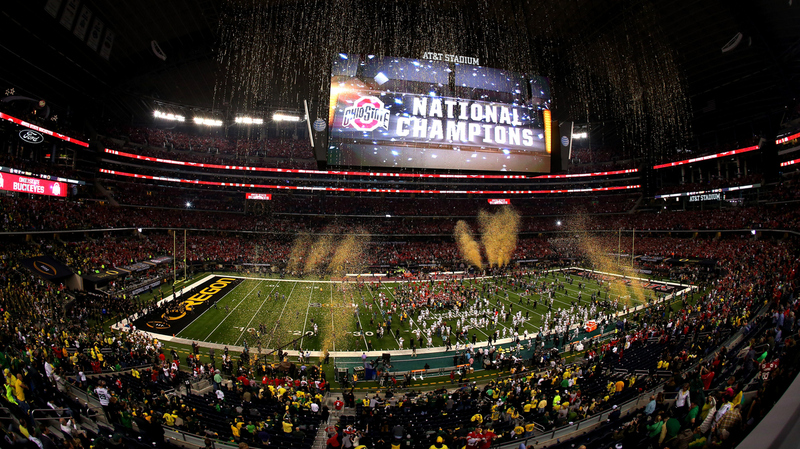 College Football Championship Sets A Cable Ratings Record : The Two-Way The championship game between Oregon and Ohio State was a hit with viewers, turning in the highest ratings in the history of both ESPN and cable TV. The broadcast averaged 33.4 million viewers. Monday night's game between Oregon and Ohio State was a hit with viewers, as the first-ever college football playoff championship turned in the highest ratings in the history of both ESPN and cable TV. The broadcast averaged 33.4 million viewers. "That was a 21 percent increase over the ratings for last year's BCS National Championship between Florida State and Auburn, which was a far closer game," NPR's Nathan Rott reports. Last night, the teams were divided by only a one-point margin in the third quarter before Ohio State pulled away late for a 42-20 win. As for how the ratings compare with NFL viewership, we'll note that TV By the Numbers reports, "Through three games, 2015 NFC Playoff games on FOX are averaging 39.3 million viewers." Monday's record ratings only narrowly trail the most-watched college football championship on network television (between Southern California and Texas). "The 2006 national championship game attracted 35.6 million viewers, a bigger audience than Monday's game," The Wall Street Journal's Steven Perlberg reports, "but it aired on ABC, a broadcast network, not a cable channel." This year's championship and two playoff games all surpassed the previous most-watched cable program, the 2011 BCS Championship between Oregon and Auburn, which attracted 27,316,000 viewers and a 15.3 rating. Despite the success of the playoff games that were played on New Year's Day (and attracted more than 28 million viewers each), things will be different next year. That's because the "playoffs" designation rotates among bowls – and two of them, the Rose and Sugar, won't be moved from Jan. 1, as Awful Announcing has noted. ESPN has acknowledged to Sports Illustrated that New Year's Eve — which isn't a federal holiday and already has an excess of prime time extravaganzas --poses "a challenge." For now, the sports giant can look on the bright side. As it noted in a news release today, "ESPN has now televised the Top 20 programs in cable history."